Cricket is a game of numbers and so it is no surprise that I have blogged several times here, at the Pitch, on 'curiously significant numbers'. The first entry was on statistical landmarks, the second, on significant dates in cricket history, and yet another on libraries and cricket. Those are numbers that are significant within the domain of cricket: averages, career records, memorable team or individual scores, and the like. But sometimes we can indulge in the converse. We can pick a number of significance to ourselves and see if cricket can somehow render it more significant. This is self-indulgent in the extreme, but today I'd like to recount two ways in which I've turned to cricket to see if there was a resonance of interest to me with significant numbers in my life. The other way I've turned to cricket when confronted with a number of interest to me is in a rather far flung domain: weightlifting. For the past three years, on many occasions while lifting weights in my gym, I have used a rather simple technique for focusing my mind before I attempt to lift a weight: I think of a cricket score that is the same as the weight on the bar and imagine myself scoring that number. When I say 'a cricket score' I mean an individual achievement. 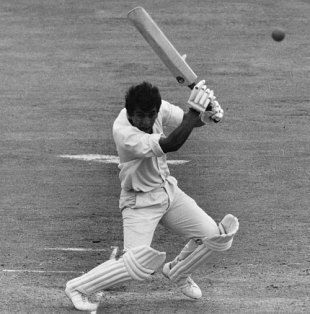 So, as an example, if the weight in question is 220 pounds I might imagine myself as Sunny Gavaskar in Port of Spain in his debut series; if it was 185, as Michael Atherton, pulling off his epic rescue against South Africa; if 155 then I am Sachin Tendulkar laying the Australian attack to waste in Chennai in 1998 … the list goes on. For some reason I am never able to summon up a score in a one-day international, not even Kapil Dev's 175 in the 1983 World Cup. There is a pattern here, of course. I lift in pounds not kilos, and the weights are almost always whole multiples of five: they end with a 5 or a 0 (fractional weights introduce a challenge that I've not yet met). This makes my mental hunt for a matching score a little more interesting but, of course, since many of my weightlifting numbers repeat, once a score has been located, I use it again and again. I have not mentioned this concentration technique to any of my lifting partners at my gym for obvious reasons: it would take too long to explain and I'm not sure I could handle all the eye-rolling that would follow; I'm already considered a serious nerd with a bizarre interest in an obscure game, and this story would push matters to the brink. There are many other interesting mental feats of arithmetic that cricket enables for the statistics-obsessed fan. But that's another story, to be told on another day.